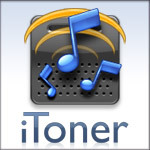 Ambrosia Software has updated iToner to v1.0.3. The new version is now compatible with iPhone firmware v1.1.1. I downloaded the updated software and it works flawlessly. I’ve got to say that custom ringtones was the feature I missed the most after I updated to iPhone firmware v.1.1.1. Kudos to Abrosia Software. The $15 cost of iToner has proven to be a sound (pun intended) investment.